The conventional RNC (Restricted Nitrous Class) systems are the first choice for professional racers that are limited by jet size. These systems feature a CNC billet nitrous plate with enlarged nitrous passages, solenoid, feed line and a Lightning bottle valve. The combination of these components results in a very dense liquid nitrous charge which allows the maximum amount of nitrous flow through a certain size jet. Results of these RNC systems are so impressive that you will have to use one to believe it. This systems includes a Lightning series fuel solenoid, stainless hard lines to connect the solenoids to the plate, heavy duty relay, switches, stainless bottle brackets and every nut, bolt and electrical connector needed to complete the installation. 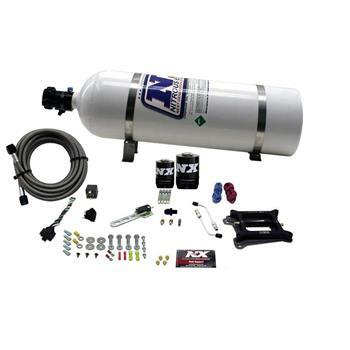 Nitrous Express RNC (restricted class nitrous) systems are guaranteed to make the most power per jet size of any system on the market. If you don’t make the most horsepower or are not 100% satisfied, NX will gladly refund you 100%.